I really wanted to stay longer. Our wonderful Warm Showers hosts in Hermann – particularly the kids – had encouraged us to extend our stay, and it was such an attractive offer. But Rich was dutifully watching the weather and thought it best that we head out right after breakfast. As luck would have it, the rain started just as he brought the bikes around. Before we even got them loaded, it was raining hard. Oh, too bad – a rain delay! We were going to be off the Katy trail for a while by the looks of the weather map. It turned out to be a delightful morning. Heading out with Keely and the girls, we got a wonderful insider’s view of Hermann. Our first stop was Espresso Laine. I was able to indulge in a latte and we sipped drinks in the attractive local coffee shop while the rain came down. Next we dashed into the new leather goods shop owned by a friend of theirs. We were fascinated by the extensive equipment in the back room and learn a bit about how shoe repair is done. And I enjoyed admiring the beautiful leather purses up front. It was true craftsmanship in the works. Next door we visited a “federally approved kitchen,” which was particularly significant. Three years ago, then 8-year-old Julie set out to help her dad fund a mission trip to Africa. Unbeknownst to him, she began making toffee (which he’d taught her to make) and sold enough batches to surprise him with enough funds to pay for his plane ticket! It has since grown into a true commercial enterprise, called Toffee on the Run, which she continues to run today with support from her family. 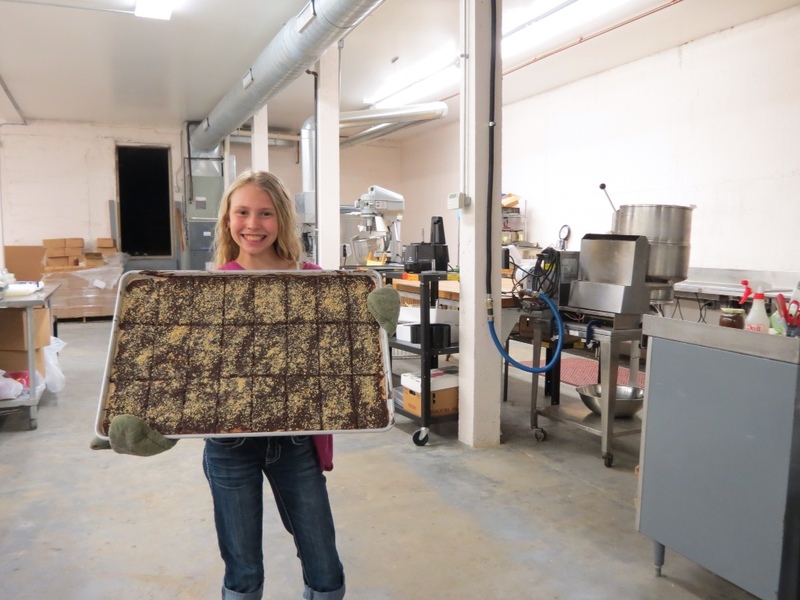 It was fun to see where produces her toffee and learn more about her company. She is an amazing young woman. Shortly after lunch, the rain seemed to be letting up. Rich declared that there was enough of a window for us to attempt to reach Augusta, although there were no firm promises of staying dry. 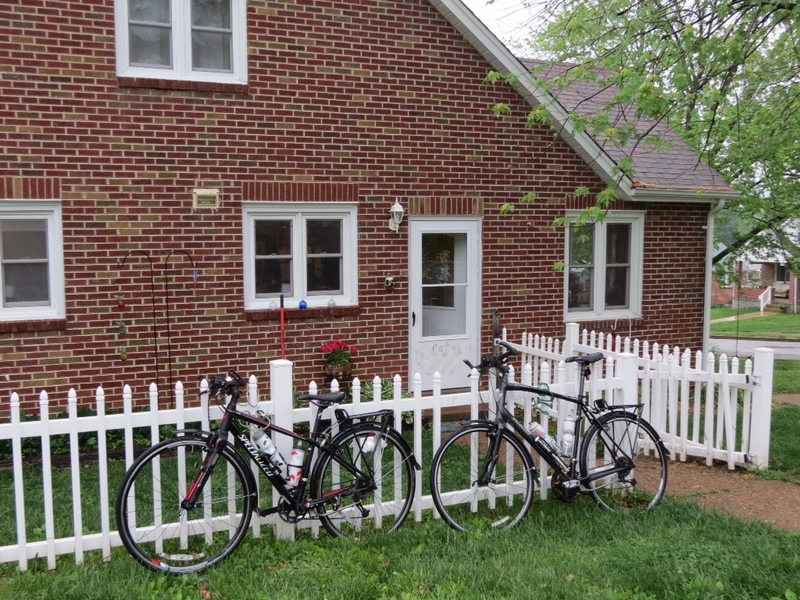 We loaded up the bicycles, said our goodbyes, and were off – back on the Katy Trail once more. With plenty of rain overnight and all morning, the trail was soft and the going was tough in places. Discovering that highway 94 paralleled the trail, Rich proposed that we take advantage of the smooth pavement and ditch the trail for that portion. Ever the purist, I wouldn’t hear of it, so we slogged on. After all, we’d planned to do the whole Katy Trail. By the next time we crossed the road, Rich had had enough. We were moving to the highway. Much to my dismay, we were off the Katy Trail again. Grumbling and complaining, I followed him down the road. It just so happened that Rich had chosen the portion of the road that was inland from the Missouri River. On the bluff side. We barely rounded the corner before we were faced with our first hill. And it was a steep one. That was followed by a swift downhill and even higher, longer uphill. And the sequence repeated itself. Again and again, for several miles. I kept my mouth shut. For “Him who Hates Hills” it was a bitter pill to swallow. When we came upon a road that led back to the trail, Rich put up no argument. We were soon back on the Katy Trail. With dark clouds behind us, we were eager to make tracks and beat the rain. By that point, our feud was over and I had to admit that Rich did have some logic. So we bounced back and forth between road and trail beyond that point, but only when the road lay between the trail and the river. We made Augusta by late afternoon, and still dry! There was a quick shower shortly after we reached the trailhead, but even that let up by the time we headed to our lodging. Once again we were truly blessed in our timing. 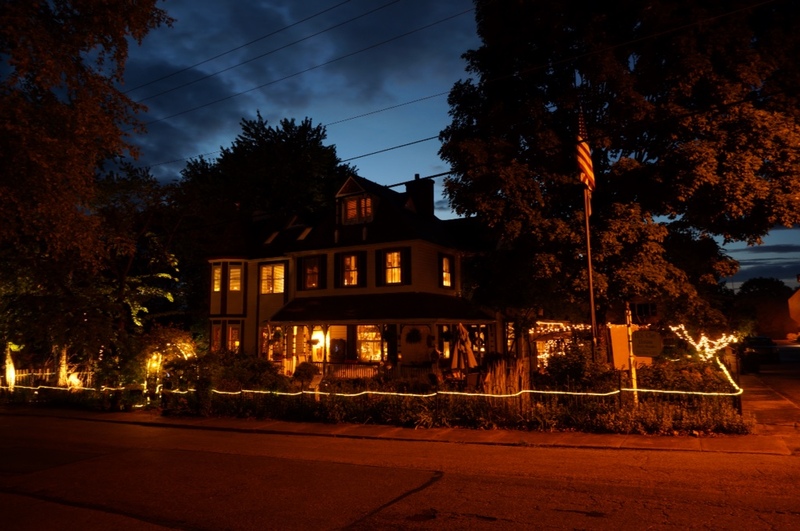 With this being the last night of our trip, we justified staying at a posh B&B called the Clay House. Returning later after dinner, it was particularly attractive in the evening light, so Rich returned outside to capture the beauty of the moment. Off the Katy Trail.